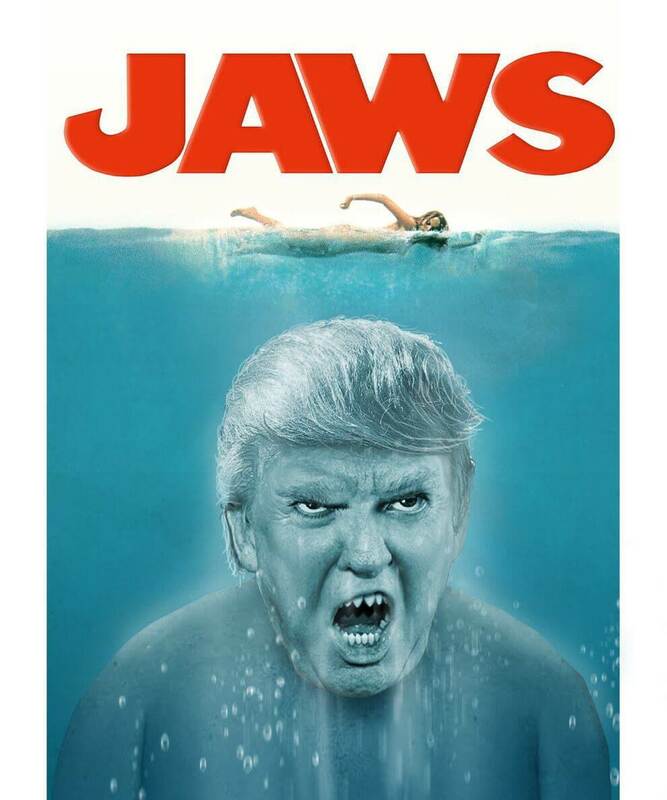 Is Donald Trump a Sharkophobe? Just as Eustace reached the edge of the pool two things happened. First of all it came over him like a thunder-clap that he had been running on all fours—and why on earth had he been doing that? And secondly, as he bent towards the water, he thought for a second that yet another dragon was staring up at him out of the pool. But in an instant he realized the truth. The dragon face in the pool was his own reflection. There was no doubt of it. It moved as he moved: it opened and shut its mouth as he opened and shut his. Metaphorically speaking, Donald Trump sleeps on a “dragon’s hoard” and harbors “dragonish thoughts,” but his overall tendencies strike me as more sharklike. Despite these tendencies, Trump is on record (via pillow talk with Stormy Daniels) as wanting all sharks to die! Now, I admit that some sharks can be a bit scary, especially the underwater variety. But Trump’s zero tolerance policy would deny citizenship to that most lovable of breeds, the Land Shark. Candygram! Listening to this description of the Land Shark, who does it remind you of? Trump was recently dealt a stunning blow by the art world. The Washington Post reports that his request for loan of a Van Gogh was rebuffed, but those clever wags at the Guggenheim did offer to lend him a consolation prize: a golden toilet. You can read all about it here. Honestly, what does Trump need with a golden toilet when he already has the services of a platinum sh*tter? In response to more news of Trump’s philandering, the Christian right has decided to give Trump a Mulligan. To non-golfers, this sounds like something from the Christopher Steele dossier. How exactly does one give a Mulligan? And how many Mulligans will it take before what we have on our hands is Mulligan stew? 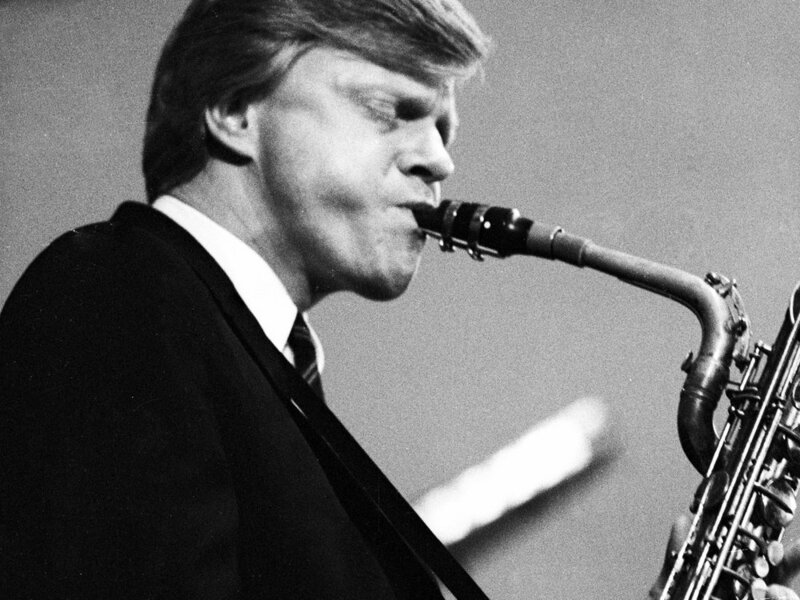 Maybe giving a Mulligan has something to do with Gerry Mulligan, the journeyman baritone sax player. Gerry Mulligan, talented jazz musician and possible secret ingredient in administering a Mulligan. Well, there you have it! Anyone wanting to give Trump a Mulligan apparently has the go-ahead. Hobo stew, better known as Mulligan stew, is one of the main attractions at the Hobo Convention. Cooked in giant metal drums, hobo stew is a mixture of meat, vegetables, and whatever else people can find, borrow, or steal and is shared with anyone who wants to eat some. It can be safe to say, one is at the mercy of the cook and you eat it or go hungry. While the nomenclature may be uniquely American, the Britons have their own version of Mulligan stew, born of the lean times after World War Two when food rationing was mandatory. The Woolton pie (named after Lord Woolton) was a pie fashioned entirely of vegetables; and while a gourmet edition was noshed at the Savoy in London, your common garden variety Woolten pie may have been less savory or delectable. Miss Jane Marple: What is this, Mary? Miss Jane Marple: Does it have a name? Such happenstance cookery brings to mind modern day freegans, who are not hobos, but who do gather their foodstuffs from what supermarkets are ready to throw out. Students in debt and the elderly poor often turn to freeganism as a way of ameliorating the high cost of food. There are solitary freegans, and others more community-minded who get together to prepare meals from shared ingredients. Now, one thing they seemingly didn’t find was shark food. If you do happen on any shark food, please FedEx to Donald Trump c/o World Economic Summit, Davos, Switzerland. I understand they’re well-supplied with champagne and caviar, but failed to stock up on seal meat and other delicacies prized by Trumpus carcharias. Seriously though, in my non-expert opinion there’s a simple way of understanding the problem of Donald Trump’s mental fitness. If he were an uncle you see at Thanksgiving who rants about all the immigrants being rapists or having AIDS, you’d just say “Pass the yams” and not think too much about it. You know he watches Fox News all day and was no genius to begin with, so you make allowances. However, there’s something called situational psychosis. A classic example is the computer HAL from 2001: A Space Odyssey. Under normal conditions, HAL would be non-threatening; but place him in an unusual situation which he wasn’t programmed to handle, and he goes dangerously apesh*t. That’s Donald Trump. Whether or not Michael Wolff’s book Fire and Fury is accurate in every jot and tiddle, it reveals a large-scale scenario which is helpful and informative: Trump didn’t really expect to win the presidency, and didn’t want to. His run was designed to bolster the Trump brand and perhaps serve as a launching pad for Trump TV. It was a money-making, ego-enhancing venture at the end of which Donald Trump would still have plenty of free time for goofiness, golfiness, and grabbiness. No one expected Trump to win, including his own family and what is jokingly referred to as his campaign staff — a motley bunch with ties to the former Soviet Union up to wazoo. Winning was both a shock and inconvenience, and also placed in bas-relief the unconventional means used to garner support — taking any help from the Kremlin that the Kremlin was willing to give (and they were willing to give plenty). Viewed as a huge publicity stunt, Trump’s campaign for president makes sense. As the loser, he would not be subjected to much post-mortem scrutiny, and few would care that people like Mike Flynn and Paul Manafort had actually been foreign agents. Winning threw a huge monkey wrench into the works. Not only would Trump lose much of his leisure time, but the minutiae of the campaign would be gone over with a fine-tooth comb, and any irregularities might lead to prosecution. Most vexing of all, Trump would be thrown into a daily situation he was massively unqualified to handle. He was not a president by training or temperament, but would be forced to play one on TV — not as make-believe, but with real world consequences for every word, every tweet, and every ham-handed or bovine-brained decision. Under those circumstances, he does exhibit signs of situational psychosis or alienation from reality. His legendary narcissism is amplified and transmuted into something far more dangerous. Rather than just getting into a p*ssing contest with Arnold Schwarzenegger over who makes a better host for The Apprentice, Trump is now trading insults with Kim Jong Un over whose nuclear button is bigger and more fully operational. Open the pod bay doors, HAL! To use the technical terminology, Donald Trump has gone poco loco en el coco (a little crazy in the head). For your uncle at Thanksgiving, a little crazy is no big deal. But for a president with the nuclear codes, and on whose every word the free world hangs, even a little crazy is too much crazy. That’s why 25th Amendment solutions should be seriously considered to remove a man who never intended to be president, is not qualified to be president, achieved the presidency by foul means (including Russian collusion), and is daily making a mockery of the office in an infinitude of ways, such that it may take years for the US to regain its reputation in the international community. Indeed, our Western allies have resolved to wait out the Trump presidency, viewing it as a temporary (but serious) aberration. Our closest allies, the noble Britons, want nothing to do with Donald Trump, and consider him a bad (if never-ending) joke. The sooner we rectify this aberration through constitutional means, the sooner we can once again show our faces on the world stage without fear of embarrassment. Trump’s rampant transactionalism is apparently contagious. Republicans as a whole don’t care that he’s unstable and unfit, as long as he can be led in the direction of tax cuts for the rich, deregulation of anything that moves, gutting of consumer and environmental agencies (not to mention the State Department), and the appointment of conservative justices. But this transactionalism comes at a price: the establishment of a new normal which is unpardonably low, and which ratifies the worst suspicions about America — that it has lost all capacity for moral leadership, and has devolved into just another selfish state. Under these circumstances, it’s imperative that lawful due process be used to end the Trump presidency before further damage is incurred. In “The case for normalizing impeachment,” Ezra Klein of Vox.com makes the point that when a president becomes seriously abnormal, impeachment should be normalized — as a reasonable choice whose consequences are not unthinkable compared to the alternative of leaving a semi-lunatic or raging incompetent in power. Dealing squarely with the reality that we are saddled with an unfit and incompetent president may cause some national discomfort or embarrassment, but the pain is far less than that incurred from radiation sickness. The problems with having Donald Trump as president re-assert themselves on a daily basis; and while some may succumb to “outrage fatigue,” it’s better to recognize the problem as “Trump fatigue,” and invoke the necessary procedures to alleviate it. As we measure out our lives with coffee spoons, do we dare to say impeach? Those worried about how Trump will earn a living after being turned out of the White House need not fret. According to knowledgeable sources, Trump has already lined up a gig with NordicTrack, a firm with headquarters in Logan, Utah and having no connection to the country of Normay. The entire Trump family will reportedly be spokesmodels for the new F-52 line of exercise equipment, code named “Javanka.” The deluxe model or “Javanka 5000” will come equipped with dual gun turrets, a drop-down pod, a vital signs monitor, a MedicAlert pendant, and a free subscription to the large print edition of Reader’s Digest. The unit will be manufactured entirely by children in a new wing of Foxconn called Foxconn Trump Tower located in Spooner, Wisconsin and sporting the latest suicide-prevention technology. An early prototype of the Javanka 5000. Mandatory retention of user for entire cycling period not yet implemented. Water bottle not included. Some assembly required. Instructional videos available from Trump University Extension Division. Trophy wife sold separately. Infrared photo courtesy North Korean military satellite, later uploaded to WikiLeaks.